Kelpie has settled for a couple of days in Campsite del la Motte, in the quiet village of Vendrennes, France (46.825623, -1.117577). It wasn’t difficult to pick out this campsite en route, most of the campsites in France close in October and this was one of the few open all year round. We arrived in the late afternoon so it was already getting dark. Although there was no-one around a groundsman at the barrier phoned the owner who spoke to Alan on the phone in English and said to choose any pitch and someone would be there in about an hour to sort us out. True to their word, a lovely french lady arrived and opened reception about an hour later. She explained where everything was, took our money and basically left us to it. We used the ASCI card for the first time – €16 per night for two nights plus €3.50 each for washer and dryer. It might seem expensive later on in the trip but at the minute we’re just glad to get a proper shower and some washing done. Wifi was free and fast, picked up by my Alfa router to create a wireless network around Kelpie. We had a wander round the shower/toilet block. The showers are clean and hot although you do need to hold the button in permanently to stop the water going off at intervals. The toilets were very clean and well maintained although strangely no toilet paper or hand washing soap in sight and you had to bring our own – something worth noting if you fancy a stopover. Always check the toilets on arrival wherever you stay as you will only make this mistake once!! The washing machine and dryer are the huge American type which take up to 18kg of washing – I did a wash which took 30 minutes and dried in 30 minutes- jeans, towels everything bone dry. It would take my machine at home 90 minutes to do a wash and 90 to dry a small load – these were amazing. It looks like a nice campsite for summer – small chalets that look like they’re lived in all year round and pitches for tents, caravans and motorhomes. There were a few other people on site, no other vans but one tent and some of the chalets were occupied – though we never actually saw any people. After a shower, the curly Moe look has gone and something resembling me has reappeared in the mirror. We walked into town. As we’ve come to discover there’s not a lot happens in French villages in the winter – since Cherbourg we haven’t actually seen a living person walking in the streets. There was nothing really open, but to be fair there wasn’t much to be open in the first place! Vendrennes is definitely not a commercial town for tourists during the winter. There were some nice old buildings and an elderly local man pointed out to us animatedly about how lovely the church was and the history of his family’s previous generations building it. All in French of course, which neither of us speak, but we picked out the poignant bits and nodded politely in thanks. He then went into his back garden where he started tending to a large hutch of rabbits which were most likely food for over the winter. There was a small Chateau in the village. Half of it was in ruin, but we guessed the other half was still lived in because of the car in the driveway and the dog which came barking down to the gate as I was taking some photographs! I was surprised at the number of large lorries that thunder through these small French villages, but given the cost of the French tolls, it is likely this is the reason. The village had a novel way of reminding drivers to drive carefully near where children exit a school – brilliant! After returning to the van, we made the most of having electric hook up and dug out our Nespresso coffee machine for a little treat. Bailey’s coffees with Christmas truffles and gingerbread hearts with apricot jam. Delicious – we know how to do glamping! The campsite was very pretty with a large pond around which were kept ducks, geese, a Shetland pony and some goats. There’s a swimming pool (closed in the winter) a restaurant (also closed) and a children’s play area – you guessed it – closed, but the site is well maintained and the pitches are large and separated by hedging- each plot had its own electric point and there were plenty of water points around the site. I’d say its lovely in the summer but there’s not much to do in the town. The van was really dirty from the mad dash to the ferry in Rosslare, it was covered in the residue of the salt from the roads and was looking black rather than white. We took advantage of the large motorhome service area and and washed the van down – providing some much needed entertainment for a local man who shouted encouragement from across the street – something along the lines of “you keep her at it fella” from the sounds of it! 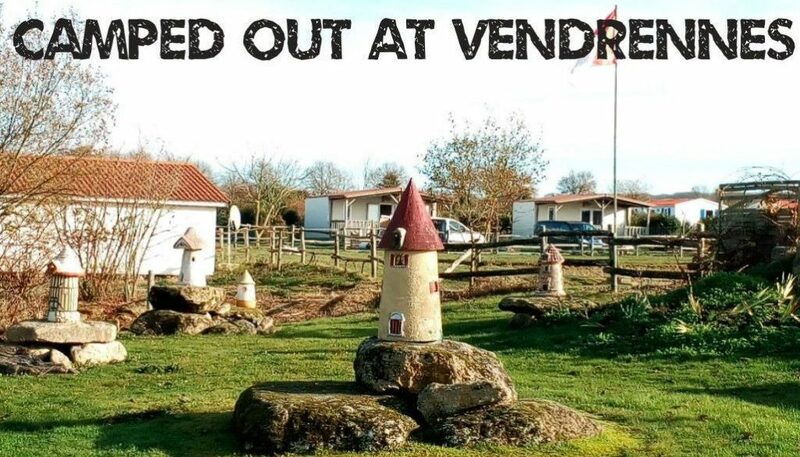 When we left the campsite, we set off for Les Herbiers to visit Lidl for groceries and Mr Bricolage to replace the cordless drill that had fallen out of the side locker on the way down to Rosslare. We lost the drill, a box of drill-bits, the new 12v heavy duty compressor and god knows what else. Note to self – WHEN CHASING THE FERRY AT 70MPH CHECK LOCKERS ARE ACTUALLY LOCKED BEFORE LEAVING!